The cannabis given to Veterans is medical-grade and lab-tested for potency and purity. 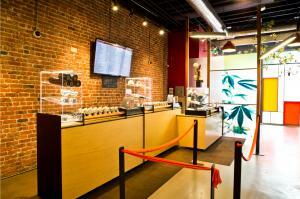 Bloom Room’s beautiful storefront dispensary located in downtown San Francisco. 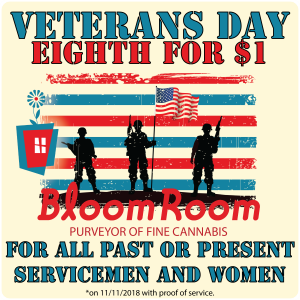 Bay Area, California – San Francisco Cannabis Dispensary, Bloom Room, is offering eighths of lab-tested medical-grade cannabis for $1 to all Veterans this Veteran's Day. Dispensary Manager, Stephen Rechif, explains that for the first time in the dispensary's history, it is required to charge a dollar due to the new regulations. "We used to be able to give Veterans their eighth's for free but that is not allowed with the new laws." The purpose of this donation is to honor the veterans who served this country but also to raise awareness about the benefits of medical cannabis for Veterans. Stephen adds, "As cannabis becomes more mainstream, there is no other group that can benefit more than our Veterans and our Seniors." "Those trauma survivors who get PTSD are even more likely to complain of nightmares. Nightmares are one of the 17 symptoms of PTSD. For example, a study comparing Vietnam Veterans to civilians showed that 52% of combat Veterans with PTSD had nightmares fairly often. Only 3% of the civilians in the study reported that same level of nightmares.